The UN was able to achieve an important objective reduction of poverty & hunger in its Millennium Development Goals (MDG) due to the economic growth of China, followed by that of India.In 2015, the UN has enunciated ‘Sustainable Development Goals’ (SDG), which call for an eradication of absolute poverty globally by 2030. As Bill Gates has said, this time, the UN will deliver on the SDGs only if India is able to deliver on its share of the SDGs. The economy of India is now the fastest growing major economy in the world, and it is likely that it will retain this bright spot for several years. India will, however, achieve its goals only if the hundreds of millions of farmers and agricultural workers are successfully lifted out of poverty. This article analyses the current situation of agriculture in India from "first principles", and provides a perspective of possible long-term solutions. No perspective of such a complex situation can be complete by itself, and this analysis does not claim to be so. The total area of India is about 3.3 million square kilometres. Of this, about 1.5 mn. sq. km. is the area of arable land, the ratio of arable land to total land comparing favourably with that in other large countries. Fallow land is about 13% of the area. The arable land in the country is well distributed over the landmass, unlike the large contiguous arable land masses in the North European plain or the mid-west in USA. This can be considered a blessing as agriculture has been well distributed throughout the country. It also poses unique economic, social and geopolitical challenges now. The productivity of agriculture in India averaged across crops (less than 350 T/year/sq. km) compares very unfavourably with the productivity in other large countries like China (almost 100% higher productivity) and USA (more than 100% higher). Despite subsidies of various kinds, the surplus generated from farming for the small land holders is very low, is at subsistence levels, and well below the average per capita income. 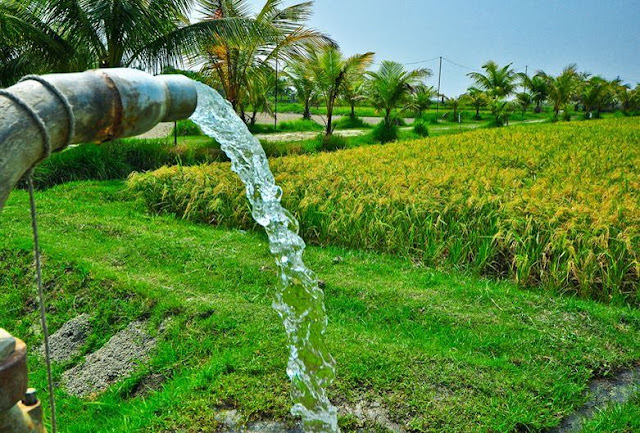 A lower fraction of land (about 48%) in India, compared to the fraction in USA & China, is irrigated currently. More than half of the Indian population is directly or indirectly connected with agriculture, sharing in generating only 16-17% of the national income, with a steady downward trend. At current levels of ICOR (incremental capital output ratio), agriculture GDP growth rates will be well below 5% per year. All of these combine to keep a very large proportion of the population poor. According to the World Bank criteria of daily income of usd 1.75 (PPP terms), about 22% of the population lives in absolute poverty. If the strata of the population which is deprived of some necessities for a decent life is estimated, as many as 700 million people would fall into the deprived (vs. absolute poverty) category. In Feb 2016, the government has set itself a target of doubling the very low per-capita income of farmers by 2022, which implies a growth-rate of 14% per annum. Low hanging fruit like substantial increase of the minimum support price for agricultural output is a double-edged sword due to the consequent social, economic & political implications of food inflation, or the impact of an increase in fiscal deficits due to subsidizing food at retail. This objective of doubling farm income will not be achieved by “business as usual” that is, through routine increase in agricultural GDP which languishes at less than 4% per year. Adam Smith’s factors of production, “Land, Labour & Capital” are examined for the key imperatives to reach this objective. A fourth factor “Knowledge” is also considered. One of the means to increase per-capita income in agriculture is to reduce the number of people who depend on agriculture for their livelihood. Nearly 250 mn. people are directly involved in agriculture, which is more than 50% of the total workforce of the country, and is also the largest agricultural work-force in the world. About 57% of the population in agriculture are landless labourers. Of the landowners nearly 85% have landholdings of less than 0.02 sq. km. Even if productivity were to double to the standards of China & USA, the very large population dependent on agriculture will continue to severely constrain the income per capita of agricultural labour. It is estimated that about 250 mn. youth will be eligible to enter the workforce over the next decade. With an urbanization of only about 31%, most of these youth will come from non-urban backgrounds. Planning Commission (now NITI Ayog) and NSSO estimates show that over the last 30 years employment generation has averaged only about 7 mn. jobs annually, and only 10 mn. jobs were created from 2005 to 2012. A very large proportion of rural youth therefore, may be forced to remain attached to agriculture, and consequently doomed to poverty, unless job creation can be stepped up significantly and rapidly. There is no head-room available to absorb additional workforce in agriculture, and the number of people engaged in agriculture needs to decrease. If the number of youth leaving agriculture and seeking employment elsewhere are included, the number of fresh job aspirants increases to about 33 mn per year! It is imperative that avenues other than employment in agriculture be created for the workforce. The example of Brazil is instructive. It has managed to bring down the proportion of population engaged in agriculture to about 15%. The annual per capital income of Brazil was almost $11,600 in 2014 (before the sharp fall of their currency Real in 2015), compared to $1600 in the case of India. At the same time, Brazil has managed to bring down the Gini coefficient of income by almost 0.1 to 0.51. The Gini coefficient of India, however, still compares favourably at about 0.37-0.38. Large scale job creation with meaningful wages can result only if the workforce is engaged in activities which are more advanced in the “value-chain” than agriculture. This requires rapid job creation in industry and services. Experience of other countries like the Asian Tigers shows that rapid industrialization can result in large scale job creation, and increased prosperity. Meaningful industrialization and the necessary infrastructure development will require access to more land. Land USA & China devote a much lower proportion of their land to agriculture (about 14% & 18% respectively) than India, while ensuring much higher levels of prosperity for their population. According to the 2011 census, agriculture land fragmentation has increased over the last 30 years, with small and marginal holdings (less than 0.02 sq. kms each) increasing by 75%. Average land holding has decreased by 33% from 0.018 sq. km. over the same period. With the population still increasing, this trend is likely to continue at least in the near future. This fragmentation has serious implications for farmers. Lack of irrigation is often cited as a reason for the agricultural distress. It is important to emphasize that India already has the highest amount of land under irrigation in the world. Urban area was about 102,000 sq. km. in 2011, which is about 3% of the total area. Industrialization (& urbanization) will take up at most another 150,000- 200,000 sq. km. over the next decade. Some of this will come from fallow land. Even if all of it comes from arable land, the arable land area will decrease by 0.2 mn. sq. km from the present 1.6 mn. sq. km. Given the very low agricultural productivity in India, there is more than adequate headroom for an increase in productivity to compensate for this decrease in area. Productivity could very well be enhanced by the additional infrastructure built on some of the land currently used in agriculture, and at the same time create avenues for more gainful employment. Given the distribution of arable land, it is very difficult to locate industry & infrastructure without impacting the current landholders. The transition has not been painless for other countries in the past, and every effort must be made to alleviate the pain. Even in the USA, where the concept of private property is zealously guarded, large scale consent (70% in India) was not mandatory before acquiring land for public purposes. Adequate compensation was ensured there. In the past rehabilitation of displaced persons has been adversely affected by corruption, apathy and indifference in India. Giving inadequate compensation & not ensuring resettlement is indefensible. Some states like Andhra Pradesh have innovatively structured transfer of land from agriculture to industry so that farmer short-term & long-term interests are taken care of. Farmers are getting higher income than they would have through agriculture, while they retain ownership of part of the land. Long-term leasing of land may be another solution. In the emotional debate around use of land, it will be more productive for all stakeholders interested in welfare of the agriculture workforce and youth to focus on enabling industrialization while ensuring the economic benefit of current landowners & agricultural workers. Another path to increase agricultural income is to achieve a substantial increase in productivity of farm land. This requires an analysis of key components of the value chain of agriculture. India has 18% of the population of the world, but only 4% of the water resources. Average annual ‘utilisable’ quantity of water is optimistically estimated at about 1100 billion cubic meters (bcm), though some estimates put this figure at about 750 bcm only. 40% of this usable water is drawn from groundwater, which is depleting rapidly. Several parts of India now consume groundwater at a higher rate than the rate of recharge. 90% of total available water is utilised for agriculture, implying that the efficiency of use of this critical raw material is about half of the efficiency in China. The chart emphasizes it is important for India to create additional surface water storage capacity, which will require land and capital. At the same time, it is essential to use this raw material more efficiently. Drip irrigation (as compared to flood irrigation) is one of the methods. Real time sensing of subsurface water through satellites needs to increase, along with dissemination of this information. Off-site and on-site technologies are now available for rapid analysis of soil moisture will also help farmers to take quick decisions. India is lagging behind in application of Knowledge for seeds, which is another key input. USA has been a leader in use of biotechnology in agriculture. China lagged behind for quite some time, but is now undertaking a substantial expansion of these programs. The EU was a reluctant entrant into this area, but since 2015 has started accelerating the adaptation. The productivity of cotton in India increased manifold by adapting biotechnology (BtCotton). India has, however, lost its early lead in use of biotechnology for seeds, and use of bio-tech seeds is not permitted in India, resulting in Indian companies exporting such seeds to countries like Indonesia & Vietnam which are reporting good results. Mechanization is another area where Indian agriculture lags. During the period 2007-2012 the high rural wage inflation was an incentive for farmers to adapt to mechanization, as reflected in the growth rate of sale of tractors. This has slowed down considerably. In any case, the meagre per farmer land-holding, and the surplus farm labour are significant constraints in the adaptation of mechanization. Artificial wage inflation is at best a short-term panacea. India has done well in reducing hunger, but nutrition levels remain poor. In 1990 approximately 46% of the population of children (upto 5 years) in south-east Asia (including China) and 48% of a similar population section in India was deficient in Vitamin A. In south-east Asia this nutrition deficient population fraction has been brought down to about 7% in 2014, while in India it remains at about 41%. Less than 10% of the output in India is processed further, compared to almost 90% in USA. Food processing can add nutrients to the food, and at the same time provide higher realizations to the agricultural sector. The government in India has recently authorized 100% FDI in food processing under the “automatic” approval route. Equipment & processes for food processing have improved considerably in the last decade, and this is an area open for considerable growth. The proximity to the Amazon and the general climatic conditions in Brazil pose the challenge of degradation of crops and agricultural produce. Conditions in India are better, though not like the conditions in USA & China. The use of fertilizers & insecticides in India is higher on a per-ton of produce basis. This over-use is degrading soil, polluting groundwater and diverting resources which can be utilized in other areas of agriculture. Biotechnology can also help in this area by making crops more resistant. The developed world wastes food on the dining table, while the developing world wastes food in transportation and logistics. It is estimated that as much as 40% of the horticulture in India is wasted in transit. Cold-chains, including temperature controlled transportation and storage are needed in a country with high average ambient temperatures. The availability and quality of electric power has been a constraint in this. India gets about 330 days with adequate sunlight annually, and the average insolation is satisfactory (5-6 kwh/m2). With the rapid advances in solar power technology power shortage need not be a concern. In a few years power storage costs will also decrease significantly, making solar even more feasible. Technology can streamline another aspect of the distribution, and provide alternate channels. Due to the marginal landholding, lack of access to markets and information asymmetry, farmers are effectively compelled to distribute their produce through intermediaries. These intermediaries dominate the whole-sale Agricultural Produce Market Committees (APMC) and capture as much as 80% of the value captured from farm to fork. Rapidly increasing internet penetration and mobile telephony can enable Farmers to access information on prices on wholesale real time basis. Subsequently they can access supply chains to markets themselves, improving their value capture. The burgeoning e-Commerce in the country has already benefited consumers and small-scale suppliers of goods. It is another channel which needs to be encouraged and enabled to provide an alternate channel for farmers too. It is often said that India has a “demographic dividend”. Much needs to be done to convert what is actually a “demographic opportunity” into a “dividend”. This conversion will not be successful if the population trapped in agriculture is not released, and agriculture itself is converted into an economic activity of value to those who choose it as a means of livelihood. The transformation of impoverished India into a middle-income country will not be feasible otherwise. Vivek Joshi is an Advisor to A-Joshi Strategy Consultants Pvt Ltd based in Mumbai, at www.expertstrat.com. He has international experience in various sectors, and is an expert in Strategy, Innovation, Venture Capital, Knowledge Management and General Management. Vivek is an invited speaker and contributes to knowledge in Strategy, Venture Capital, Economics, Challenges of the 21st Century and Geopolitics.